Like a growing number of holiday meals throughout New England, Christmas dinner at Denali Delmar and Bruce Sweetser’s house will come in part from their backyard garden. 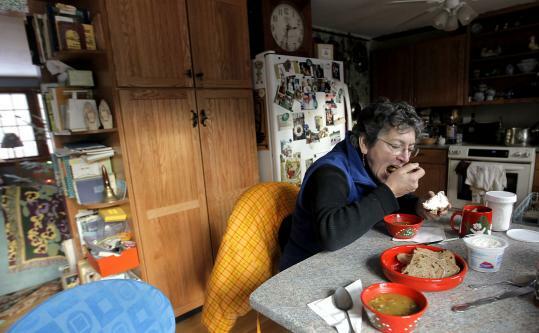 But this retired Westford couple will also add another locally grown delicacy to their menu. That’s right. The couple’s freezer is stocked with meat harvested from animals killed in motor vehicle accidents. No, this is not an insert-joke-here moment. It is part of the family’s continuing evolution toward a greener, more organic, and sustainable life. Locavorism, the idea that eating local is healthier and better for the environment, has exploded nationally and around New England in recent years. Some locavores have even taken up hunting as a way to forge a deeper connection to what they eat. Delmar and Sweetser’s diet might best be described as an extreme version of that philoso phy. For them, the idea started routinely enough, with a garden. Delmar, 64, has gardened most of her adult life and began filling the field on their 3-acre land with everything from parsley to a pear tree. About two years ago, the couple, children of the peace and love days of the 1960s, read “The Omnivore’s Dilemma,’’ learning about the horrors of factory-farmed meat. Soon, they began raising chickens, and Sweetser, who had hunted as a boy in Maine, tried his hand with a bow after a 37-year hunting hiatus. “I like to eat unadulterated meat,’’ Sweetser said matter-of-factly in his kitchen. Then came the day they happened upon a car accident, in what they call a totally serendipitous moment. The only victim was a deer. “I said, ‘Wow, this is too good to be true,’ ’’ Sweetser remembered. Some Massachusetts police departments keep lists, some official, some informal, of residents interested in harvesting meat if a deer is not too mangled after a run-in with a car. There are eight people on the Westford Police Department’s official list. Animal control officials in Lowell also call a handful of people they know can harvest the meat. But before police pick up the phone, Massachusetts law requires that the driver of the car get first dibs on the deer. If the driver or passengers do not “desire to salvage a salvageable deer,’’ then law enforcement can give the animal to an approved nonprofit, such as a sporting club, or a Massachusetts resident, the statute says. In other words, they can go to the list. Delmar and her husband were not on the Westford list when they came across that first deer in 2009. But, they are now, and they have harvested three deer as a result, freezing the extra meat for regular dinners and special occasions like Christmas. He guts the deer in their yard, wearing rubber gloves and old clothes. It’s a skill he learned from his father, who also hunted. Blood Farms, the Groton slaughterhouse that the couple uses, said it butchers up to seven road-kill carcasses a year. Captain Chris Baker of the Massachusetts Environmental Police said he has responded to only about six deer vs. vehicle accidents in his 13 years on the force. It is hard to tell just how widespread the trend of hunting and harvesting really is. The Westford Police Department declined to provide the other names on that town’s list. It is also hard to tell if lists like these exist elsewhere. There are hints that the hunting trend, at least, is catching on. An insurance broker in Virginia writes a blog and teaches a course about “Deer Hunting for Locavores.’’ Two men in San Francisco formed the “Bull Moose Hunting Society’’ for city-slickers who want to connect with their food. For Westford police Captain Victor Neal, it just makes sense that hunters would take their skills a step further and harvest road kill. And on Christmas, the smell of venison immersed in a marinade will fill the house again.